“TTFCU will now be able to leverage video when working with members at home, work, and on the go, exceeding expectations with every experience in every channel," said POPin Video Banking Collaboration founder and CEO Gene Pranger. POPin Video Banking Collaboration, the world’s first interactive mobile video banking solution, today announced its adoption by Texas Tech Federal Credit Union (TTFCU) to leverage video across all channels—mobile, web and in the branch—delivering new and unique ways for members to manage their financial resources. Ushering in a new era of self-service, POPin Video Banking Collaboration enables face-to-face video chat and simultaneous collaboration between financial institutions and their customers across all digital channels. Through this patented technology, members can access branch services and complete nearly all banking needs via the web, personal mobile devices, or branch-based video, removing the need for either party to be in a physical branch or office. POPin Video Banking Collaboration streamlines common workflows such as contract reviews, ID verification, document signature and presentation sharing. Through such unprecedented access to live financial representatives, POPin provides the most complete member experience, allowing financial institutions to offer longer hours, expanded services and immediate, personalized assistance. The platform also plugs directly into the backend of existing systems, providing financial service providers the tools they need to better serve members and improve internal performance through sophisticated communication and analytics. 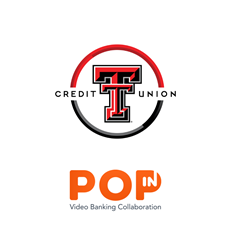 To learn more about how financial institutions like Texas Tech Credit Union are using POPin Video Banking Collaboration to improve financial services, visit http://www.popinvideobanking.com/. Headquartered in Lubbock, Texas, Texas Tech Credit Union was originally founded in 1959 and today serves more than 19,000 members across Texas. Driven to meet needs and create value, Texas Tech Credit Union is leading the industry with innovative online, mobile and in-branch solutions. For more information, visit https://www.texastechfcu.org/ or call (806) 742-3606. POPin Video Banking Collaboration is a web and mobile video software solution bridging the gap between businesses and their customers. Through increased connectivity, this comprehensive and interactive solution enhances customer communication and action to empower sales and give companies the tools they need to exceed customer expectations. For more information regarding POPin, visit http://www.popinvideobanking.com or call 801-417-9000.